USDCAD has lost more than 80 pips after hitting high of 1.3340 level. Canadian dolalr is gaining strength against all majors on account of rising crude oil prices.The pair is consolidating after forming a minor bottom around 1.32250 low made on Feb 18th 2019. Markets eye US FOMC meeting minutes and BOC Gov Poloz speech for further direction. 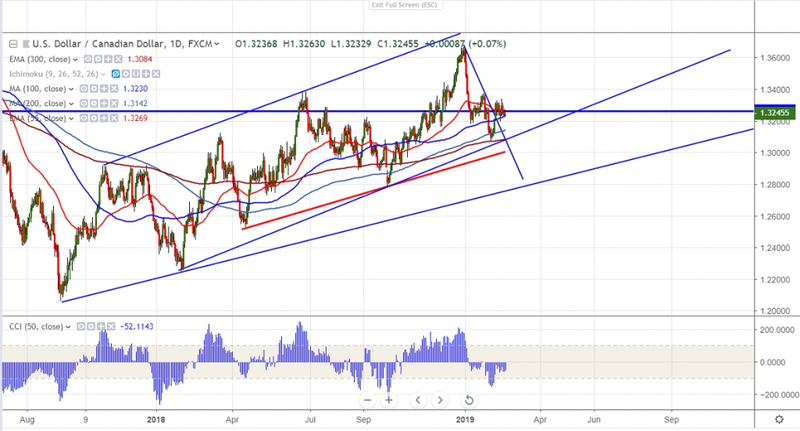 The pair has formed temporary top around 1.36648 on Jan 2nd on account of better than expected Canadian economic data and jump in crude oil price and declined till 1.30685. It is currently trading around 1.33110. Crude oil prices is consolidating after hitting 3 month high. Market eyes US -China trade talks for further direction.Brent has jumped more than $15 from low of $50.29 low made on Dec 26th 2018. It is currently trading around $6. On the higher side, near term resistance is around 1.3320 and any break above will take the pair to next level till 1.3380/1.3435/1.3500. The major support is at 1.3230 and any violation below will drag the pair down till 1.3190/1.3130 (200- day MA)/1.3079. It is good to buy on dips around 1.3230 with SL around 1.3185 for the TP of 1.3380/1.3435.